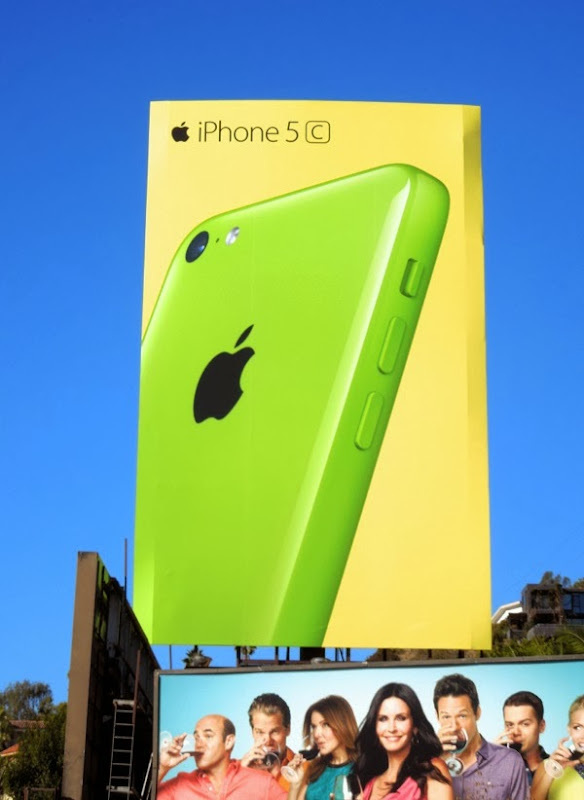 This may technically be the middle of winter, but it feels like spring has sprung with this second wave of vibrant billboards for Apple's new iPhone 5c smartphone. 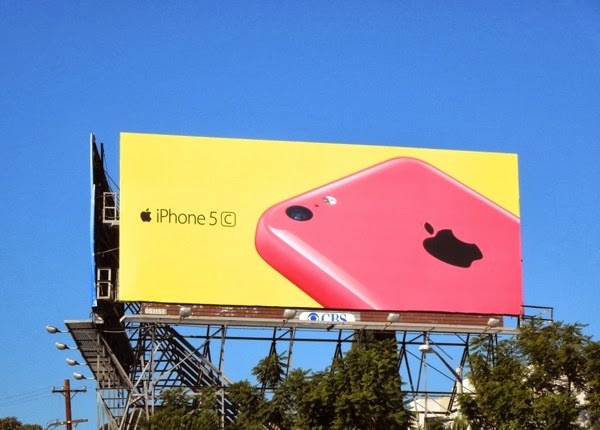 The launch ad campaign for the new plastic iPhone back in September 2013 featured four of the five new colours (white wasn't used), with each colour phone on the same colour background, so pink on pink, blue on blue, etc. 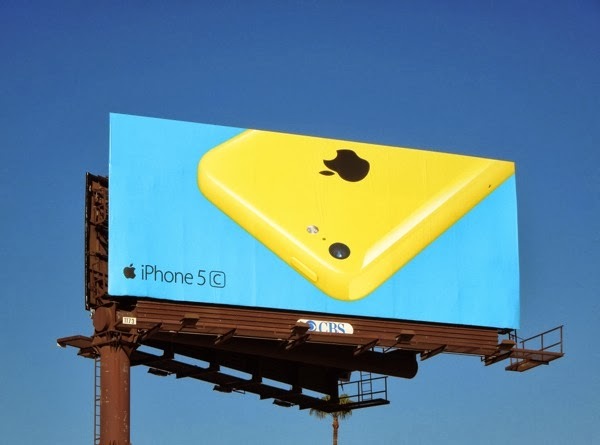 This second installment of creatives switches things up, and almost immediately those first wave billboards seem outdated with this new mixing of colour. 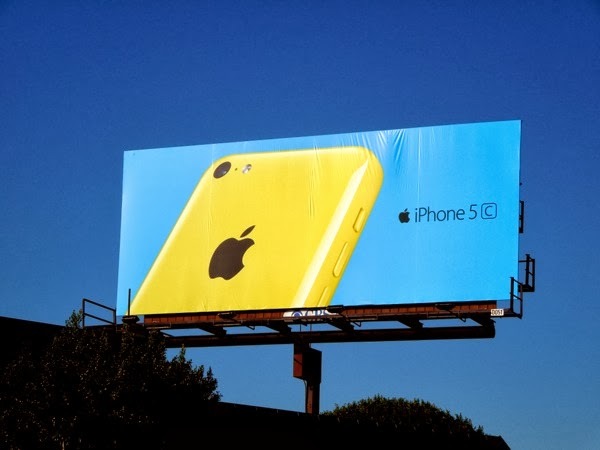 Be sure to compare these striking new ads, which continue to illustrate the sleek design of the smartphone, to the launch billboard campaign for Apple's iPhone 5c and you'll see what Daily Billboard means. Like the initial wave, this colourful ad design is a real point of difference from Apple's iPad out-of-home advertising which was predominantly shown on a clean, white background. 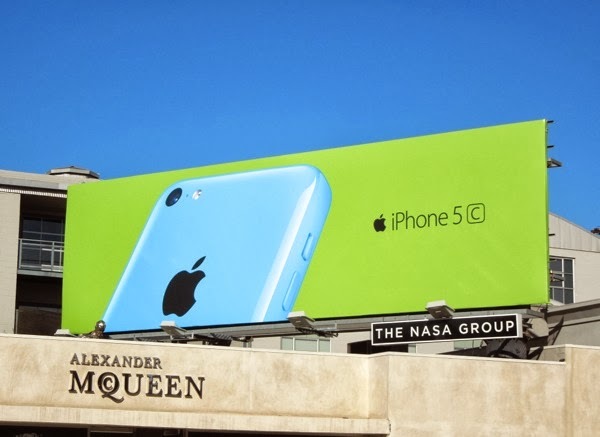 These new billboards with blue phone on green backdrop, green phone on yellow and yellow phone on blue, plus more variations, were snapped from January 13 to January 15, 2014 around the streets of Los Angeles, from Melrose Avenue to Sunset Boulevard, Santa Monica Boulevard to La Brea Avenue, Hollywood to West L.A. 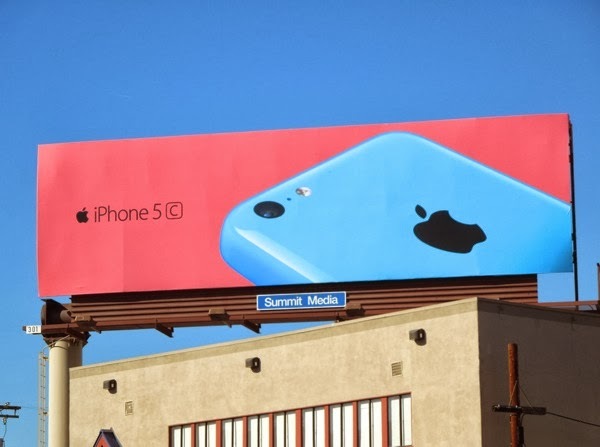 The sheer onslaught of these latest billboards certainly makes Daily Billboard wonder how big an out-of-home media budget the tech giant must have, on top of all the television commercials and other advertising it pays for. 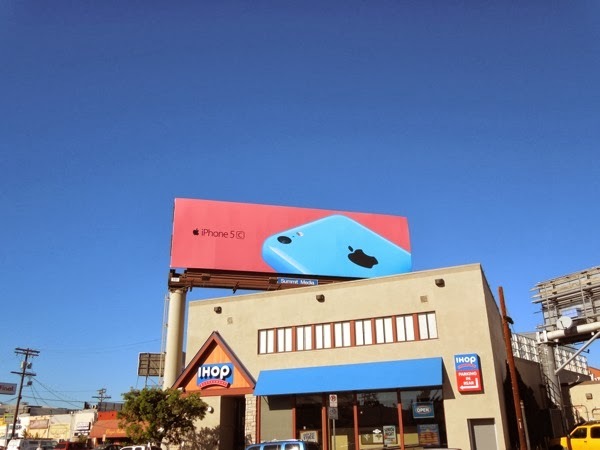 As always, it helps that the beautiful Southern Californian skies are a real showcase for these billboards when the rest of the country are struggling with snow, storms and cold weather. 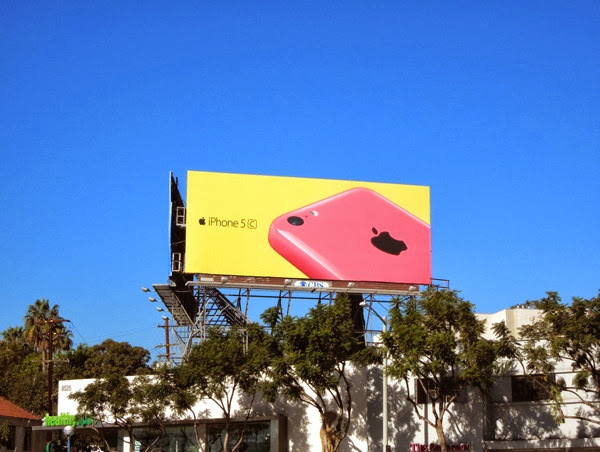 Hopefully these bright, vibrant ads will go some way to help lift spirits. 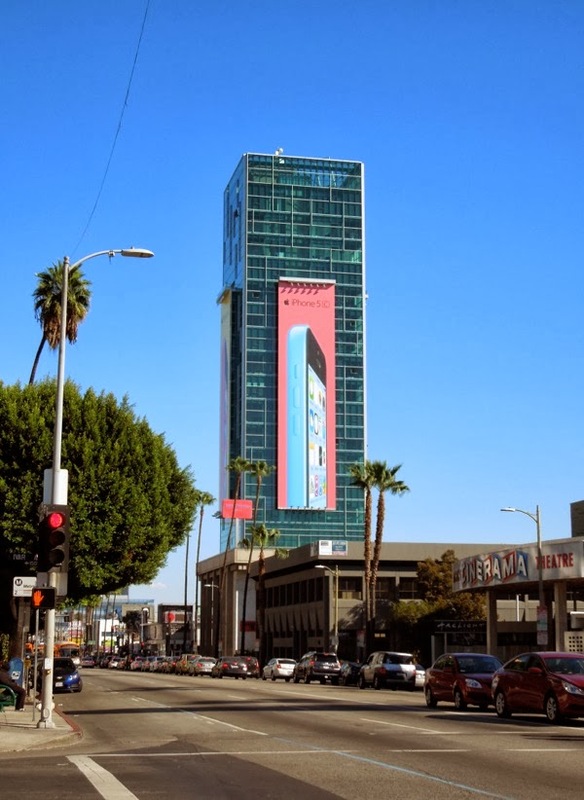 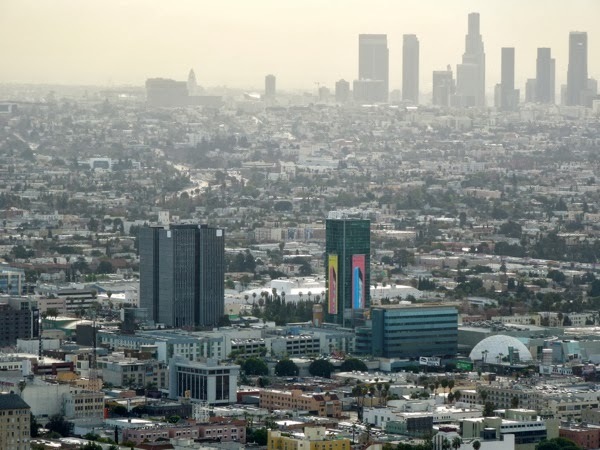 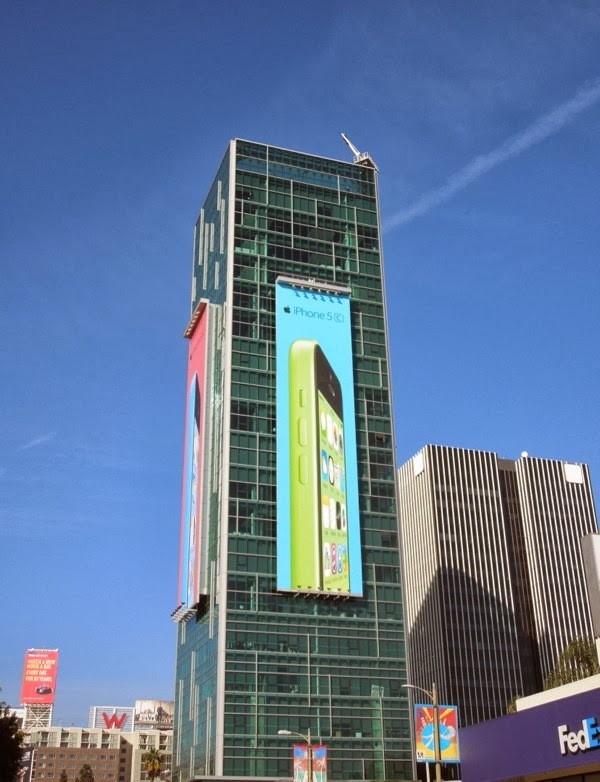 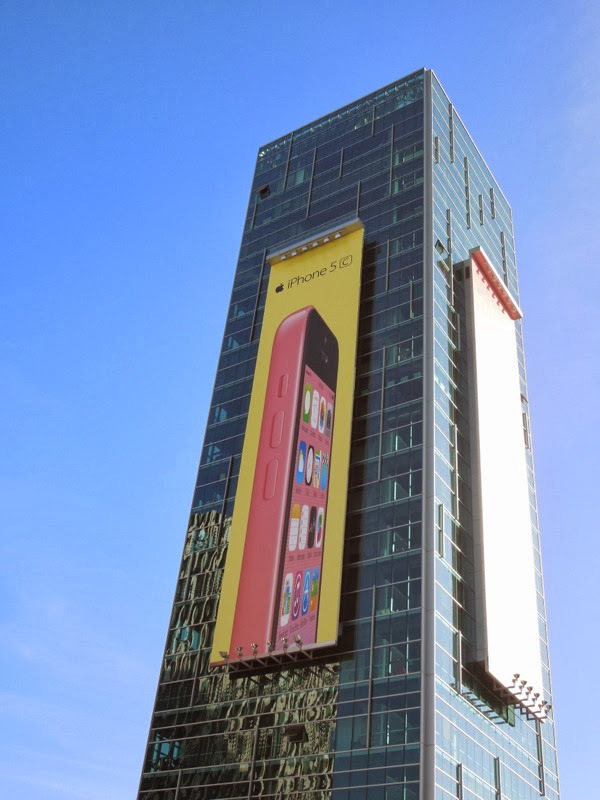 UPDATED: In addition to all the varied standard landscape billboards around town, Apple has also commandeered the Sunset Vine Tower to advertise its iPhone 5c second wave creatives. 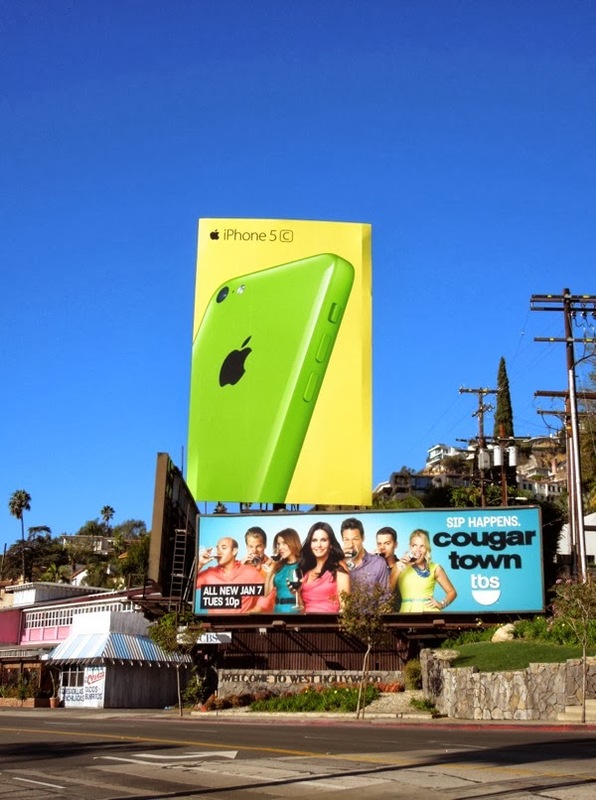 As a point of difference, these billboards show the front and side of the smartphone, rather than the back, on these super tall ad sites. 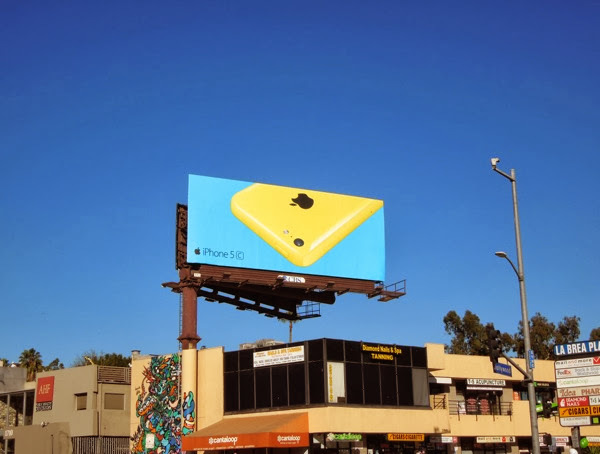 These vibrant billboards were photographed from January 29 to February 1, 2014, and as you can see they are certainly visible from near and far. 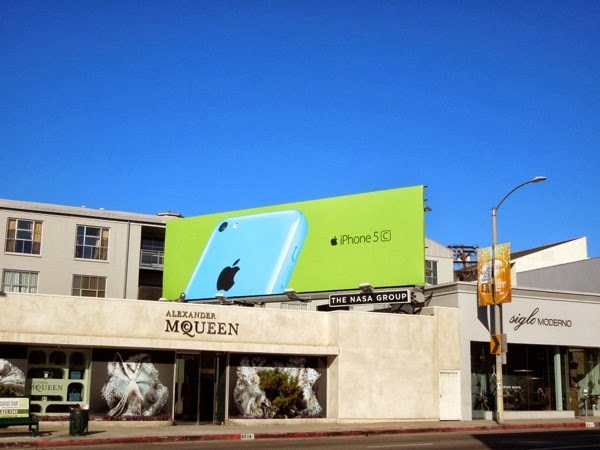 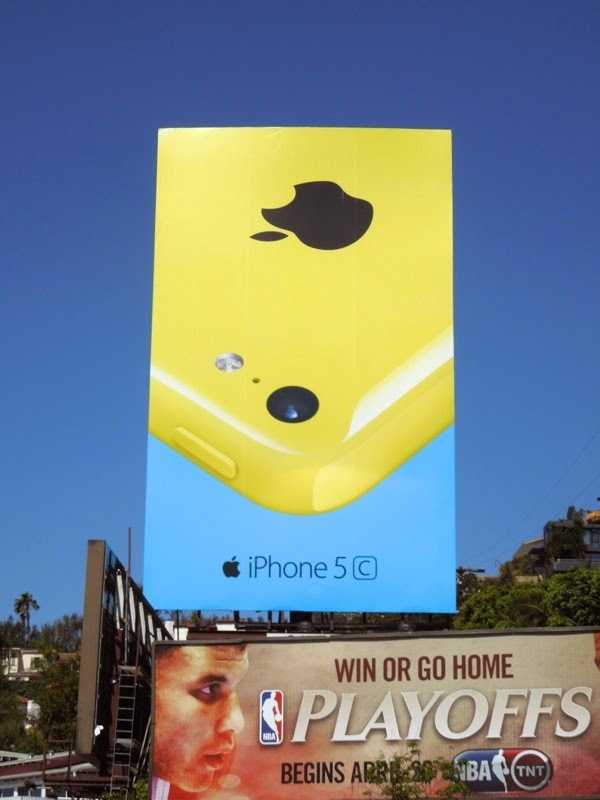 UPDATED: Here's a new giant-sized yellow iPhone 5c billboard snapped in Apple's regular ad location along Sunset Strip on May 11, 2014.